Trailer mounted concrete pump is a type of concrete pump generally mounted on a single axle or multi-axle trailer and high pressure is used to pump the concrete. These trailers are transported to construction sites by attaching them to a suitable vehicle. 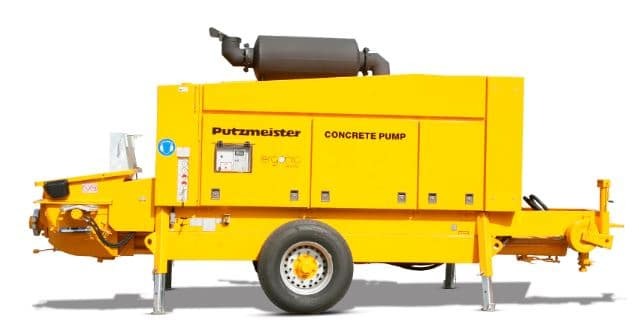 These are also called stationary or line or static concrete pumps. Trailer mounted concrete pumps are available in different pumping capacities ranging from 30 cubic meters per hour to 135 cubic meters per hour. They mounted on a trailer so, they can tow from site to site easily using the appropriate vehicle. Concrete is pumped through a flexible pipeline system which is connected to the concrete pump at one end and pipes are assembled by suitable couplings. So in this case, concrete can be pumped to greater distances with more number of pipes. Pipelines generally used are of 75 to 200 mm in diameter and made of steel. Couplings are also made of steel and are used to assemble these steel pipe sections. The pipeline outlet is generally handled by the workers and they place the pipe wherever concreting is necessary. But steel pipe sections are heavy in weight hence, at the end of the steel pipeline, a flexible rubber pipeline is attached which provides better control over discharge location. For larger diameter pipelines, which are difficult to move by workers a boom is provided at the end of pipeline and crane is used to lift this boom when relocation of the pipeline is required. Multiple pipelines can be carried from a single concrete pump which makes it easier to supply concrete to a different location at a time. The concrete pumping in different pipelines can be controlled by providing a special gate valve for each pipeline. 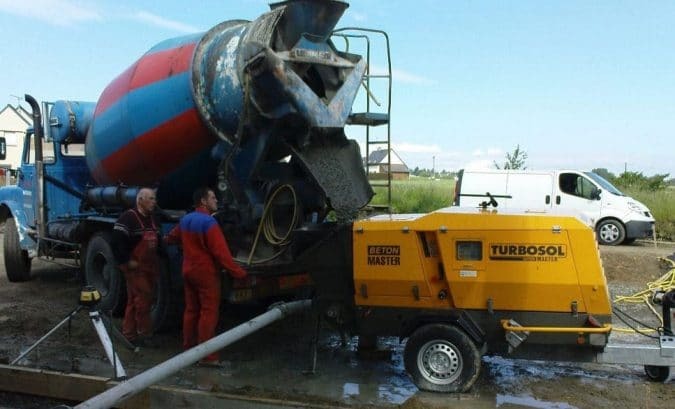 The trailer pump should be easily accessible for concrete mixers or ready-mixed concrete trucks which feed the concrete into the concrete pump. To achieve a high rate of discharge, the concrete pump should be fed continuously. The main advantage of a trailer mounted concrete pump is the flexibility that comes with the pipeline appendages which can be increased, decreased and turned as per the need. Hence, concreting can be done easily at greater heights or depths or unreachable lengths using this pump. Horizontal pumping up to a distance of 2000 meters and vertical pumping up to a distance of 400 meters can be done using trailer mounted concrete pumps. 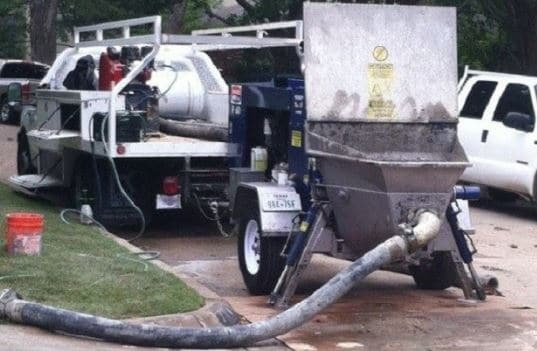 Numerous pipelines can be stretched from one trailer mounted concrete pump. Hence, relocation of the concrete pipeline can be eliminated which is extremely useful in case of a larger area or multi-storey buildings. Trailer mounted Concrete pumps of different capacities are available according to the size of work. The capacity of trailer mounted concrete pumps is far greater than other types of pumps such as truck mounted or mobile concrete pumps. The trailer arrangement makes it easier to transport the concrete pump to the required location just by attaching it with a vehicle. This type of pump is more useful for concreting in tunnels, bridge structures and power stations etc. where other types of concrete pumps cannot reach.